Frank Iero. Photo by Macey Norvell. Tuesday night, Frank Iero returned to The Granada for the first time since November 2015. He and his current band The Patience played a tight 75 minute set, and gave lots of love to the city of Lawrence in between songs. The band was truly impassioned, the audience could see how much they enjoy playing their music. Each member of the band had an infectiously animated playing style. 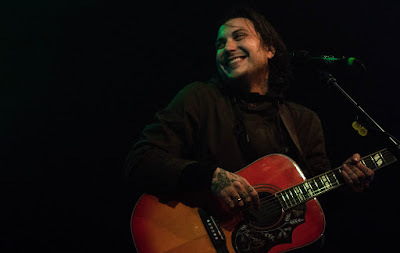 Frank took time to introduce many songs with a few words or a story, which helped to create an intangible bond between the fans and the band. Their live sound was consistent with the sound of their studio albums, with distorted vocals that were at times drowned out by heavy guitar. Regardless, the majority of audience members knew every word and sang along to every song. The crowd lit up when the band played "Joyriding" and "Oceans" as their final two songs, after warning the crowd that they weren't going to "walk off stage and make [the fans] clap for an encore." Supporting band Dave Hause & The Mermaid got a warm welcome from the crowd. The Loved Ones' frontman and his backing band provided endless catchy guitar riffs, accompanied by a melodica during a couple songs.